Brad Ziegler was 8-1 with 13 saves and a 2.22 ERA for the Diamondbacks in 2013. PHOENIX — Brad Ziegler, who held the bullpen together when the Diamondbacks turned to him as their closer last season, has agreed to a new contract, he said in a tweet Friday. Just agreed to an extension with the @Dbacks! Really excited to stay in Arizona for a couple more years, at least! Ziegler, who was in his fourth and final year of arbitration eligibility this winter, is to make $4.5 million in 2014 and $5 million in 2015. The D-backs have a $5.5 million option for 2016 with a $1 million buyout. "I’m just so blessed and thankful to be with an organization that wants me around awhile longer and is willing to provide me with some multi-year security for the first time in my career," said Ziegler, who turned his career around after becoming a submarine pitcher with the A’s. Ziegler was 8-1 with 13 saves and a 2.22 ERA last season, and he converted 12 of his 14 save opportunities while stabilizing the back end of the bullpen after manager Kirk Gibson turned to him on July 11, the Friday before the All-Star Game. Ziegler, 34, had a save against Milwaukee that night and another two days later, cementing the closer’s job he held for the rest of the season. He was 4-0 with 12 saves and a 1.76 ERA after becoming the closer. The D-backs’ tied for the major league lead with 29 failed save conversions in 2013, but 21 of those came in the in the first half of the season, before Ziegler took over. The recent addition of closer Addison Reed, acquired from the Chicago White Sox on Monday, appears to mean that Ziegler will return to a primary setup role, along with J.J. Putz. David Hernandez and Will Harris also spent time in that role last year. 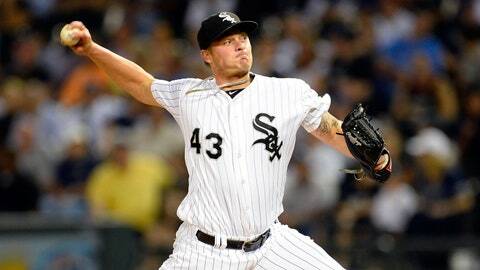 Reed had 69 saves in the last two seasons with the White Sox, including 40 in 2013.